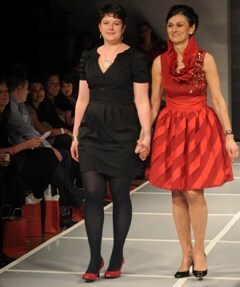 This year’s StyleWeek Providence has adopted a philanthropic element as evidenced in last night’s Go Red StyleWeek Challenge, an extraordinary Project Runway-like competition where 14 of the week’s showing designers dressed a heart disease or stroke survivor to benefit the American Heart Association. As cardiovascular disease claims the lives of nearly 500,000 American women each year, the Go Red for Women movement began in 2004 to raise awareness of heart disease as the number one killer of women. The red dress has become the national symbol to promote the cause, and events surrounding the now iconic symbol include fashion shows like last night’s standing-room-only event at the Providence Biltmore. With boatloads of crystals at their disposal supplied by Rhode Island’s own Swarovski Elements, the red dresses shimmered under the lights as models sashayed down the runway escorted by their assigned designer. Project Runway Season 7 standout and the Ocean State’s own Jonathan Joseph Peters debuted a floor-length evening gown (pictured above), Kara Wickman (who we featured HERE) showed a bustier top with a crystal-embedded ta nk neckline and floor-length skirt with a train gathered at the back with a detailed rosette, and Jessica Abernethy designed the evening’s crowning look (above left), a tea-length cocktail dress with a stunning over-sized pleated collar, fitted waist, and full skirt with red-on-red biased stripes. 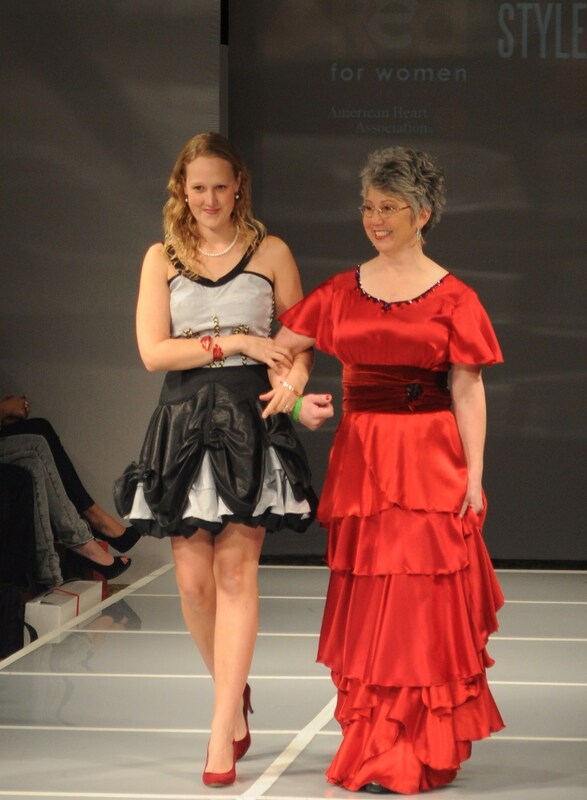 Sarah Prost, mastermind behind Yellow Clover and Cologne, fashioned a gown with a banded waist and tiered skirt that flowed down the runway (at right) . Daniela Corte stole the sentimental spotlight with her strapless evening gown she designer for her mother (see below). In truth though, they were all winners, celebrating fashion and health and a bright future ahead. Entry filed under: Uncategorized. Tags: American Heart Association, Anibal Melo Photography, Go Red StyleWeek Challenge, Jonathan Joseph Peters, Kara Wickman, Project Runway, Project Runway Rhode Island, projuct Runway Season 7, Sarah Prost, Sarah Prost Cologne, Sarah Prost Providence, Sarah Prost Yellow Clover, StyleWeek Providence.